There was much more to Apple’s media event last week than the unveiling of two new iPhones and a smartwatch. 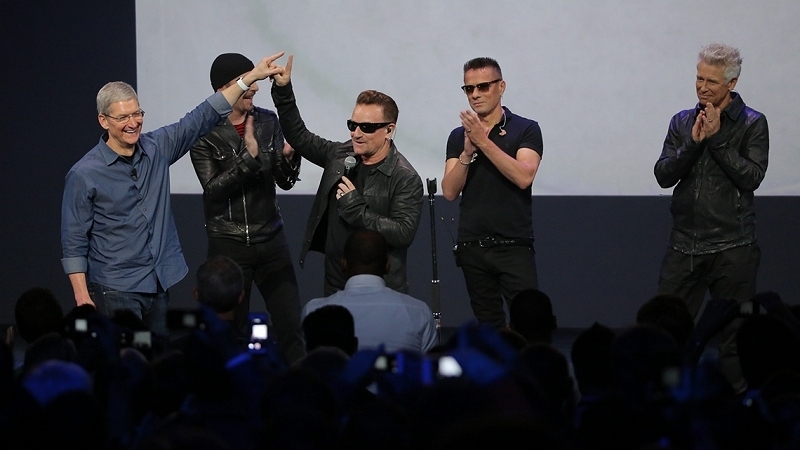 Near the end of the keynote, CEO Tim Cook invited U2 on stage to perform for those in attendance. Afterwards, the two announced that U2 was releasing a brand new album called “Songs of Innocence” and that every iTunes user in 119 countries around the globe would be able to download it free of charge. Never before has a group launched an album that has been available to so many people (500 million iTunes customers) at once. It was a historic occasion but as with most publicity stunts, the driving factor is money. No, U2 didn’t release the album free of charge out of the kindness of their hearts or to create a lot of publicity. Apple paid for the opportunity to launch the album exclusively on iTunes which appears to be part of an overall larger ad campaign. As noted in this Billboard article, the lead single from the album is set to be featured in a massive media campaign from Apple that’s valued at $100 million by multiple sources. U2 manager Guy Oseary never actually confirms or denies the figure but odds are, the album release kicked off the beginning of the campaign. In a separate post from Re/code published last Friday, the site claimed users had downloaded more than 2 million copies of the album since it was released on Tuesday. It’s difficult to tell whether that’s a solid number or not as there are multiple variables at play not to mention the fact the album is streaming on iTunes Radio. Either way, we can expect to hear a lot from the band in Apple advertising leading up to the lucrative holiday buying season.